There are so many reasons to have friends in the cake industry, or in any industry for that matter. However, it’s so easy to get caught up in gossip, or find yourself a little jealous of someone else’s success. If I could give one word of advice, and I’m going to use one of my favourite words…As I always say, we should do all things with integrity. Be kind, be helpful, be a good friend, and keep your business to yourself, and off of social media. If you don’t want drama in your life, don’t create it. Now that I’ve covered some of the not-so-nice things about “friends” in our industry…Let’s talk about some good stuff, and there’s plenty of it! I’m lucky enough to be able to attend many cake shows, whether it’s to teach, compete, judge (sometimes it’s all 3), and sometimes to just hang out with friends. I have friends that live close (within a 1 hour radius) and friends afar. I cherish both. Let’s talk about my local peeps. They’re the ones I get to see often, the ones that I go for lunch or dinner with, the ones that I can help, and can help me. Yes, we all make cakes. Yes, we all live in the same selling area. And yes, technically, we are competitors. Let me just say, there is enough business out there for everyone. These are my friends who understand how tired I am sometimes, because they are too. They’re the friends that understand that I might not be able to attend a birthday party on the weekend, because they can’t either. We are all in the same boat, and we all understand. These are the people who can give advice and I can advise. Who wouldn’t want that? I’d rather be friends with my fellow cakers than fight amongst each other. What were to happen if Friday rolled around and I slipped and broke my arm, and oh nooooo! I still had a wedding cake to finish. Well, I know that in that kind of emergency I could count on a friend. We share recipes and each other when working on something new that we’ve never done before; it’s a pretty cool thing! I am thankful for these friends. You know who you are. Cake shows…ahhh the cake shows. Social media…ahhh social media. This is how I’ve been able to meet so many wonderful, long distance friends. Many became friends through Facebook and Facebook cake groups and many of these friendships were solidified by meeting these folks in person at a cake show. As many of you know, I’m Canadian (and have many long distance Canadian friends) but have so many friends in the U.S. Some from New York, Ohio, Oklahoma, Florida, Iowa, California, Atlanta, and the list goes on and on…I’m blessed. While at the NCACS show (National Capital Area Cake Show) in Virginia a couple years ago I was introduced to a tall, dapper, Australian gentleman. We instantly hit it off! Once we both got home, we didn’t see one another for a long while. No kidding…I was in Canada and he was in Australia. We communicated a little through Facebook, liked each others posts and looked forward to one day seeing each other again. In 2016, my youngest daughter decided she was going to travel, and spend some time in Australia. Being the protective Mom, I panicked and told her not to find a good job and not to find a boy she really liked…selfish? Quite possibly. I wanted my baby girl to come home. My friend is such an amazing guy, he offered for her to stay at his home, he offered to take her site seeing, he offered her to contact him if there was an emergency and she needed help. I decided, this long distance friend was a keeper. It wasn’t until 2017 that I would see him again, and I’m so glad I did. This man has become such a good friend, a close friend. We often Facetime and share what’s going on in our lives, and what we have going on that week. We’ve done impromptu tutorials for each other when we just aren’t sure of what we’re doing or, if one of us just has a better way. He tells me what he’s cooking for dinner that day, and I tell him what I’m not cooking lol. We share recipes, and we share our very best! After all this reading, and praise, I’m sure you wondering who this amazing guy is? Wait no longer, it’s Mr. Greg Cleary! Greg lives in Brisbane, Australia and is known for his sugar flowers and beautiful, elegant cakes. Now a little more about Greg. Greg Cleary’s passion for baking, decorating cakes & creating exquisite gum paste flowers started in his early teens, and now with over 40 years of experience he is considered one of the best in the industry. His dedication to the discipline of sugarcraft makes him a sought out teacher, presenter, and Judge with over 25 years of experience both in Australia and overseas. Greg is always willing to share his knowledge and expertise to inspire others in the world of cake decorating and sugarcraft. Through his business Sweetums Designer Cakes, which is in its 21st year of operation, his clients include A list celebrities, sports stars, and Olympians. He’s a regular on the competition circuit as a competitor, winning at the highest level in State and National competitions. 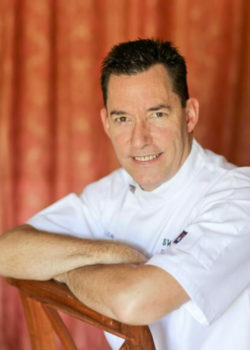 Greg is renowned for his relaxed teaching style, his life like sugar flowers, and romantic wedding cake designs. That is quiet the resume, wouldn’t you say? Yet he’s so humble, kind, and willing to share. A keeper…but I already said that, lol. For an opportunity to learn from Greg, he will be teaching here in Ontario, Canada at Icing Inspirations on September 16th, 17th, and 18th. Here’s the link to register. Speaking of sharing, Greg has given me permission to share with you, his best ever chocolate cake recipe. I am not a fan of chocolate cake, but this one…I just can’t get enough. It’s light and fudgy, chocolatey and sweet, but not too sweet. When I first made it, I messaged him to make sure I didn’t do anything wrong, as the batter is quite loose…so don’t panic, that’s how it’s supposed to look. Trust me when I tell you, you will never want to make another chocolate cake recipe ever again. Did I mention that it’s the easiest cake to make? You don’t even need a mixer! This one gets great volume and rises high, yet doesn’t dome…sorry guys, no scraps to trim off and nibble on. It’s super moist, so no need for syrup. 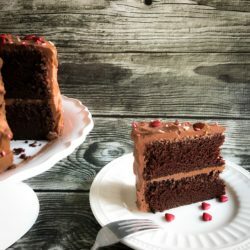 All you need is some yummy chocolate frosting, which I’ve included below. Greg’s yummy cake and my chocolate frosting, and these two long distance buddies have created something quite magical. Enjoy, you’ll thank us later…and Greg (Dollie), I thank you.